For years, dental x-rays have been used to diagnose oral health complications and detect decaying or damaged teeth. X-rays provide a unique view of the mouth that isn’t possible with a visual exam alone. When x-rays are taken, the teeth and bones absorb the majority of the ray, making them highly visible on film or on a screen. Nearly all new dental patients are x-rayed, although you may instead request that previous x-rays be transferred from another dental provider to your new dentist. By comparing your x-rays with your full mouth examination and dental history, your dentist can prescribe effective treatment and recommend a plan for preventative care. that dental x-rays deliver very low levels of radiation and are considered completely safe? In fact, x-rays are even considered safe during pregnancy and while breastfeeding so long as a leaded apron and collar are used to protect your body from exposure. If you are pregnant or think you may be, tell your dentist so proper precautions can be taken. Should I get dental x-rays? Yes. Dental x-rays are capable of identifying tooth decay and damage beneath the surface of the teeth where caries are less visible during an examination. Furthermore, x-rays provide a reference point for the progression of decay in your mouth over time. You should have x-rays taken on a regular basis, but especially if you are experiencing oral health complications or are planning to undergo a dental procedure, such as a root canal. What should I expect when I get dental x-rays? Getting traditional dental x-rays can take several minutes. A thick paper tab is placed into the mouth, which you will be asked to bite down on. Most patients find that dental x-rays are completely painless and do not inflict any level of discomfort. In some cases, dentists intraoral x-rays, as well as extra-oral x-rays that snap images of the face, jaw and skull. Extra-oral x-rays are typically used to identify impacted teeth, such as wisdom teeth. What happens after my dentist has taken x-rays? Your x-rays will be saved either on film or digitally. 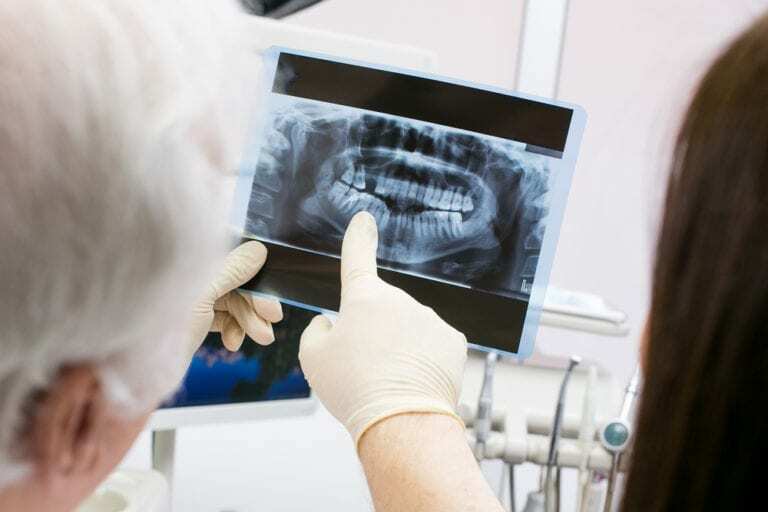 In the future, your dentist may request additional dental x-rays every few years to monitor the health of your teeth, gums and jaw over time. If you are considered to be high risk for oral disease or are exhibiting symptoms of complications, your dentist may prefer to take x-rays more frequently.